WASHINGTON — The majestic cherry blossoms in the nation’s capital blanketed the surroundings of the Jefferson Memorial in a pretty pink hue April 7. Since their peak bloom, a few days remain for the public to appreciate the trees’ beauty for the season. To be able to traverse the grounds of the National Mall alongside couples at every corner posing for selfies, however, one had to brave a not-so-majestic commute if traveling by car. The 6-mile drive one way to the blossoms from Old Town Alexandria in the late morning hours was far from transcendent. The George Washington Memorial Parkway was marked by congestion points at the exits for Reagan National Airport and the 14th Street bridge. Traffic exacerbated approaching the Arlington Memorial Bridge. The iconic structure between Arlington National Cemetery and the Lincoln Memorial had an inbound lane closed due to construction. The three remaining lanes offered little room for comfort as motorists avoided potholes and pedestrians while navigating a maze of cones. After crossing the bridge, motorists were trapped in a Kafkaesque search for parking. According to the National Park Service, construction will be completed by the early part of 2021. The $250 million project began in 2018, the agency indicated. The bridge was constructed in 1932. 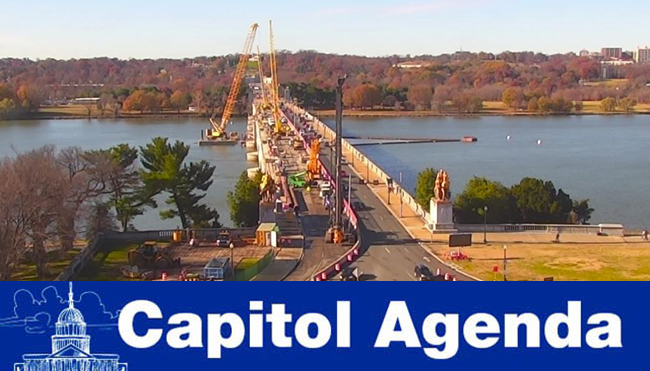 Besides serving as a symbol of Americana, the Memorial Bridge recently garnered the distinction of being among the more than 47,000 structurally deficient bridges in the country. A new report by the American Road and Transportation Builders Association relying on federal data also had the Brooklyn Bridge on the list. Infrastructure funding proponents, such as ARTBA and the U.S. Chamber of Commerce, are reminding policymakers this year of the wasted productivity caused by congestion. A way to secure long-term funding for major repairs is to ensure the solvency of the Highway Trust Fund, an account that helps states with infrastructure repairs. Dwindling revenue from the federal gas and diesel tax is insufficient for the fund to meet its obligations. That’s why the chamber is calling for a 25 cents-per-gallon federal fuel tax. Thus far this year, neither Congress nor President Donald Trump have shared concrete plans for improving the country’s overall infrastructure and enhancing connectivity along freight and commuter corridors. April 10, 11 a.m.: The country’s top transportation officer is back on the Hill, again to defend President Trump’s fiscal 2020 budget request for her department. Secretary Elaine Chao will face appropriators from the House. When she testified before Senate funding leaders, lawmakers pressed her on air travel. Surface transportation policy is expected to command more attention. April 9, 10 a.m.: The House Highways and Transit Subcommittee hosts a hearing on safety. April 9, 10 a.m.: The House Natural Resources Committee hosts a hearing on Puerto Rico’s electric power network. April 9, 10 a.m.: The House Environment and Climate Change Subcommittee examines the fiscal 2020 budget request for the U.S. Environmental Protection Agency. Witnesses include EPA Administrator Andrew Wheeler. April 9, 2 p.m.: The House Environment Subcommittee hosts a hearing on climate change. April 9, 2 p.m.: The House Transportation and Infrastructure Committee hosts a hearing about the Economic Development Administration. April 9, 6 p.m.: The George Washington University School of Business hosts a panel discussion on artificial intelligence. Speakers include Manoj Saxena, executive chairman of CognitiveScale; and Anuj Mehrotra, dean of the GWU School of Business. April 9-10: Executives from the cement and concrete industries have scheduled visits with congressional staffers. April 10, 9:30 a.m.: The House Water Resources and Environment Subcommittee hosts a hearing about the Harbor Maintenance Trust Fund. April 10, 10 a.m.: The House Energy Subcommittee hosts a hearing about energy efficiency. April 10, 10 a.m.: The Senate Environment and Public Works Committee meets to consider the Diesel Emissions Reduction Act of 2019. April 10, 2:30 p.m.: The Senate Transportation and Safety Subcommittee hosts a hearing on pipeline safety. Witnesses include Howard “Skip” Elliott, administrator of the Pipeline and Hazardous Materials Safety Administration; Robert Sumwalt, chairman of the National Transportation Safety Board; Paul Amato, vice president of engineering, operations and environmental, health and safety for the Iroquois Pipeline Operating Company, representing the Interstate Natural Gas Association of America; and Robin Rorick, vice president for midstream and industry operations at the American Petroleum Institute. Senate Majority Leader Mitch McConnell (R) is focused primarily on confirming Trump’s nominees. Infrastructure is hardly mentioned on the Senate side of the Capitol. Remember what T&I ranking member Sam Graves (R-Mo.) said: Congress has about five months to act on infrastructure policy. Welcome back to the Executive Calendar, Heidi King. After the 115th Congress adjourned sine die without considering her nomination to become administrator of the National Highway Traffic Safety Administration, the president renominated her this year. A recent party-line vote at the Commerce Committee paved the way for a spot on the Senate floor agenda’s docket. Floor managers have yet to schedule a vote on the nomination. Key Democratic senators continue to oppose the nominee. King is the agency’s deputy administrator. Truck platooning will be more relevant in the coming years with the advancement of autonomous vehicle technology, Rep. Rodney Davis (R-Ill.), the ranking member on the Highways and Transit Subcommittee, told Transport Topics last week. With all we’ve done in that country, they have systematic mismanagement of the goods and services we’ve sent to them. White House Deputy Press Secretary Hogan Gidley on MSNBC on April 2, in reference to Puerto Rico.